Where will you be on December 31, 2014 when the countdown to the New Year begins? Say good-bye to 2014 and welcome 2015 at Knott’s Berry Farm. The folks at America’s first theme park are going all-out to make sure you and your family have a fabulous day and special night. During the day you can ride the roller coasters, get wet on a white-water raft and scream on the thrill rides. There are rides that are perfect for the whole family and a section of the theme park with rides just for younger children. Climb aboard the train at the Calico Railroad station. Everyone loves the carousel and you can have fun playing the arcade games. Make sure you don’t run out of energy because there is still a night filled with music and live entertainment. For this night and this night only, families will be treated to live musical performances, comedy and even some cool magic. The New Year’s Eve party gets started around sundown and continues through the night. Krazy Kirk and the Hillbillies! Head over to the historic Bird Cage Theatre to catch an absolutely entertaining comedy and blue grass music show. The banjos and fiddle playing will have you tappin’ your toes and clapping your hands. In between the music, the jokes will be flying. You’ll laugh and want to stomp your feet at this authentic country and comedy show. The festive mood continues with a non-stop blend of old school R&B and hip hop music when the Clueless Remix takes the stage. Its a high-energy show where you can dance to the beat and get ready to ring in the New Year. Calico Square is the site for this entertaining show. Let the Latin Beat inspire you to get up and dance. The music is rhythmic and romantic. Everyone can salsa. Even Snoopy makes a guest appearance to show-off his dance moves. Make your way over to Fiesta Plaza and join the party. I you love to laugh and have good wholesome fun, you won’t want to miss this comedy show. Family-friendly comedian will be appearing at the Wagon Camp. He’ll be telling jokes, doing magic and interacting with the audience. A great time will be had by all. What’s a New Year’s Eve party without plenty of good food? Enjoy a gourmet buffet at Spurs Restaurant. Dinner is from 4:00 pm to 9:00 pm. Adults eat for $26.99 and kids (3-11) can fill-up for $14.99. • Merry Christmas, Snoopy – An original ice show that provides heart-warming moments starring Snoopy and his friends on skates. • Ghost Town’s Snow and Glow! Presentation – Thousands of Glowing lights twinkle to the beat of “Let it Snow” on Main Street and then it starts to snow. • Dance, sing, and join in the spirit of the season over at Camp Snoopy. Lucy’s Wish List features Charlie Brown, Linus and Lucy in a show kids will love. Be prepared for a fun, but long day at Knott’s Berry Farm on New Year’s Eve. The theme park has extended hours and is open from 10:00 am to 1:00 am. 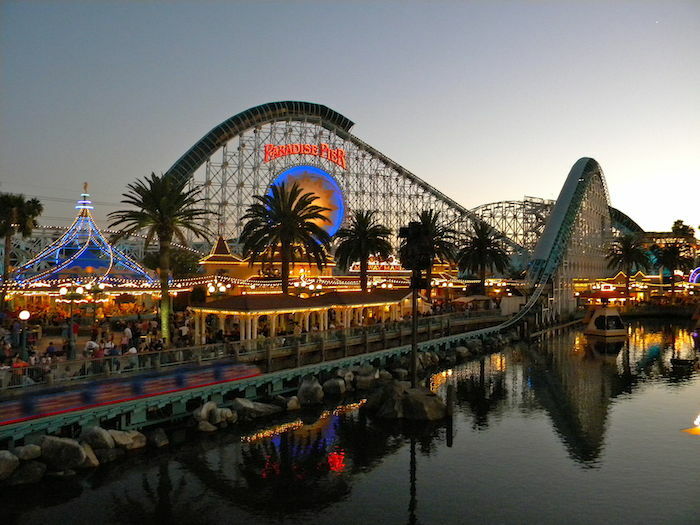 It is only about a 15 minute ride from the Anaheim Express Inn Maingate in Anaheim to Knott’s Berry Farm in Buena Park. If you start early and get tired, you are close enough to the hotel to come back and take a break. Then, head back and watch the Knott’s Sky Cabin rise over 200 feet. When the clock strikes midnight, shout “Happy New Year!” and watch the fireworks light up the sky.